Jazz duo recordings can provide an exceedingly wide range of musical expression including but not limited to, profundity, humor, tenderness, introspection, exuberance and a whole host of others which can all change at the drop of a flatted-fifth. This type of mercurial interplay is on full display on this live gig from the Théatre Port-Royal in Montreal, Canada. 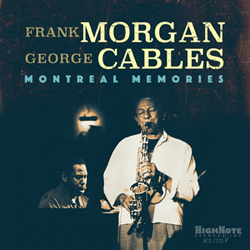 Morgan and Cables played together frequently and their improvising is imbued with an almost telepathic communication. Cables' large piano tone is the perfect accompaniment to Morgan's slightly dry, Bird-like sound. At the same time, their spontaneity and sheer joy of music making succeeds in even making the chestnut "All the Things You Are" sound fresh and newly wrought.